In this step you will clone your personal repository to your local computer. Cloning your repository locally creates a file directory on your computer that will kept in synch with your online repository. Making changes to live source files makes your website vulnerable to user errors. Since we all make mistakes, we instead clone the source files locally and make our changes on our own computer where we can first test that our changes won't break things in the process. Once we verify things are as they should be we then can push our changes to the live source files (usually a master branch). From there, others can pull in our changes to their local copy, and update files of the website. On the side navigation, click Clone, then Clone in Sourcetree to create a local directory where you can store the website files. This opens the Clone New dialog in Sourcetree. Within Sourcetree, choose the appropriate destination for your personal repository, then click Clone. You'll arrive at the empty directory in Sourcetree, and an empty directory named website was created on your local computer. Download the source files and unzip them into the empty directory you just created. 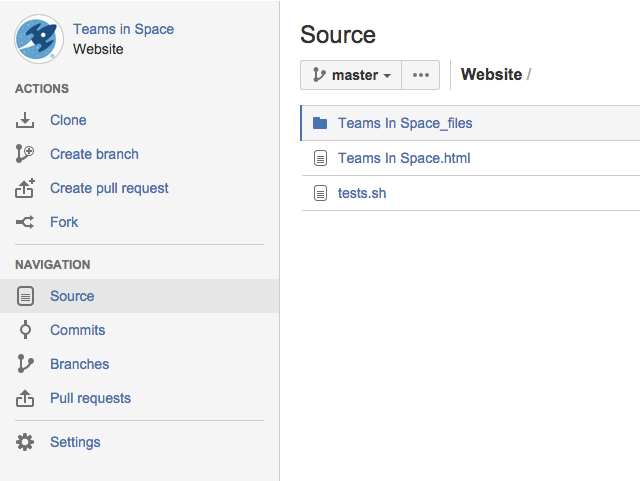 Add the files to your personal repository using Sourcetree (or the command line). Select the files you added in the previous step by checking the box named Unstaged files. The files then appear in the Staged files pane. Click Commit, add a message in the comment box, and check the box Push changes immediately to origin/master. Go to your personal repository and verify the files were added. Clone your personal repository from the command line. You can also copy the command directly from your empty repository. Look under Working with your repository. Add the files to your personal repository from the command line.